Freedom 7, NASA's first spacecraft to launch an astronaut into space, landed in Boston on Aug. 29, 2012 for display at the John F. Kennedy Presidential Library and Museum. 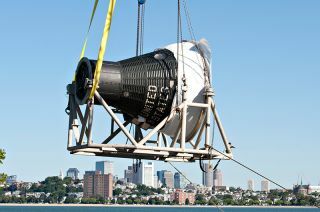 Freedom 7, NASA's first spacecraft to launch an astronaut into space, has landed in Boston for display at the John F. Kennedy Presidential Library and Museum. The space capsule, which on May 5, 1961 lifted off with astronaut Alan Shepard for a 15 minute suborbital mission, arrived at the JFK Library on Aug. 29. On loan from the Smithsonian, Freedom 7 had previously been on exhibit for 14 years at the U.S. Naval Academy in Annapolis, Md. "Freedom 7 has arrived!" the library announced on its Facebook page. "Thanks to a generous loan from the [National] Air and Space Museum, Freedom 7 will be here until December 2015." "We choose to go to the moon," Kennedy said on Sept. 12, 1962. "We choose to go to the moon in this decade and do the other things, not because they are easy, but because they are hard." Less than seven years later, Neil Armstrong and Buzz Aldrin achieved JFK's goal of landing on the moon. Armstrong, who died on Aug. 25, will be remembered at a national service in Washington, D.C., to be held on Sept. 12 also. The JFK Library has not yet announced the details for the opening of its Freedom 7 exhibit. The display marks only the second time that a Mercury spacecraft has visited Massachusetts. Liberty Bell 7, which followed Freedom 7 into space, was displayed at the Museum of Science in Boston in 2002. The JFK Library hosts a permanent exhibit devoted to the space program, which includes a moon rock returned to Earth in 1971 by the Apollo 15 crew. Freedom 7 will remain at the library for the next three years. It will then be moved to the National Air and Space Museum in Washington, D.C., where curators plan to exhibit it within a new gallery that "will tell the story of the Mercury, Gemini and Apollo programs, going from nothing to six landings on the moon in only 14 years — only 8 years and 2 months from Kennedy's challenge to successfully landing." NASA gave Freedom 7 to the Smithsonian five months after it flew, becoming the first manned spacecraft added to the National Collection. Prior to it going to the Naval Academy in 1998, the space capsule was on display at the National Air and Space Museum. See more photos of Freedom 7’s arrival at the JFK Library in Boston at collectSPACE.